Our clients and Duke University Health System have resolved and settled all claims against the current defendants arising out of the genomics-based clinical trials for cancer treatment. 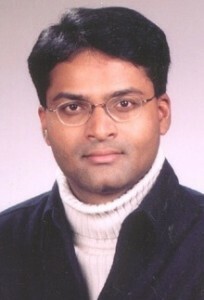 The specific terms of the settlement are confidential, by mutual agreement of the parties. In January, the case was postponed because of a case of the flu among the plaintiff’s attorneys. Also that month, a judge ordered Duke to release more documents. This isn’t the first time Potti has faced legal issues — he has settled at least 11 cases of malpractice for $75,000 or more, as we reported in 2011. We’ve contacted Duke for comment, and will update if we hear back. Where is the settlement money coming from? If even partially from federal grants or tuition fees, then doesnt the public have a right to know? I remember discussing with others on RW against Potti to be allowed to continue working in clinic. The argument was, if he doesn’t do research, he shouldn’t be banned from working clinically as doctor. Now I read here about malpractice issues. But even then, would you trust your doctor’s medical opinions and skills if you knew there were serious questions about his academic activities? Having trust in your doctors abilities is a good thing – it will help the healing process via the placebo effect. Your feeling of trust may not reflect his/her true abilities, though. Better let the hospital decide about those, they have more data to let them judge the quality of their personnel. I would not trust him or any other ethically challenged people with my or anyone else’s health. He should move on to a field where that trust is not needed. Does that mean that there could be another batch of defendants in future? So still no closure for Duke, then? Since the good doctor is in the news again, figure sleuths might enjoy a hitherto unretracted paper dating from 2006 in the early-middle Duke phase, before the statisticians had begun sharpening their pencils. Chen G1, Sircar K, Aprikian A, Potti A, Goltzman D, Rabbani SA. 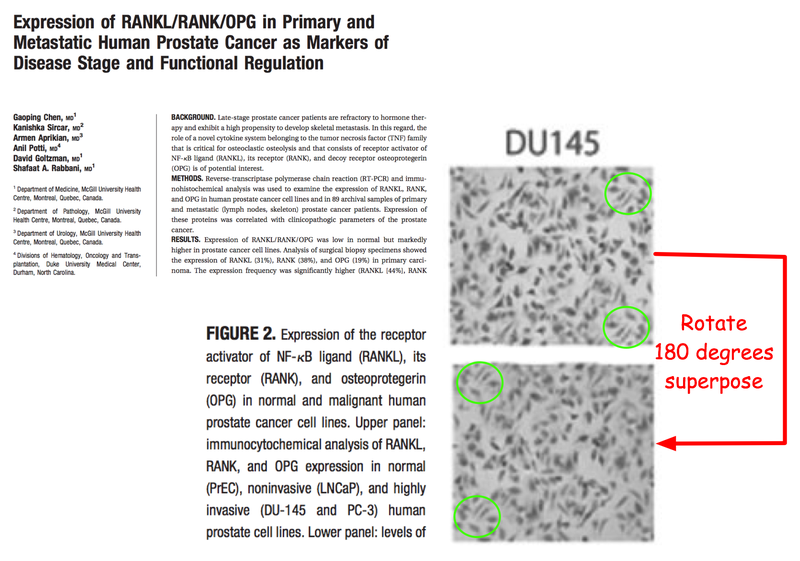 Expression of RANKL/RANK/OPG in primary and metastatic human prostate cancer as markers of disease stage and functional regulation. Cancer. 2006 Jul 15;107(2):289-98. The paper is open access. 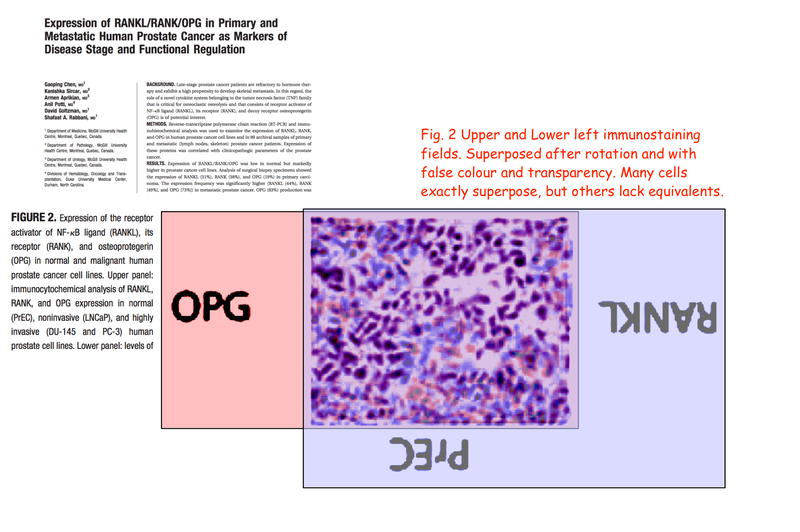 Your attention is specifically drawn to the immunocytochemical analysis in Fig. 2. There is more, much more. Note: In fairness to the Rhodes Scholar manqué, he is listed as the fourth MD out of six. 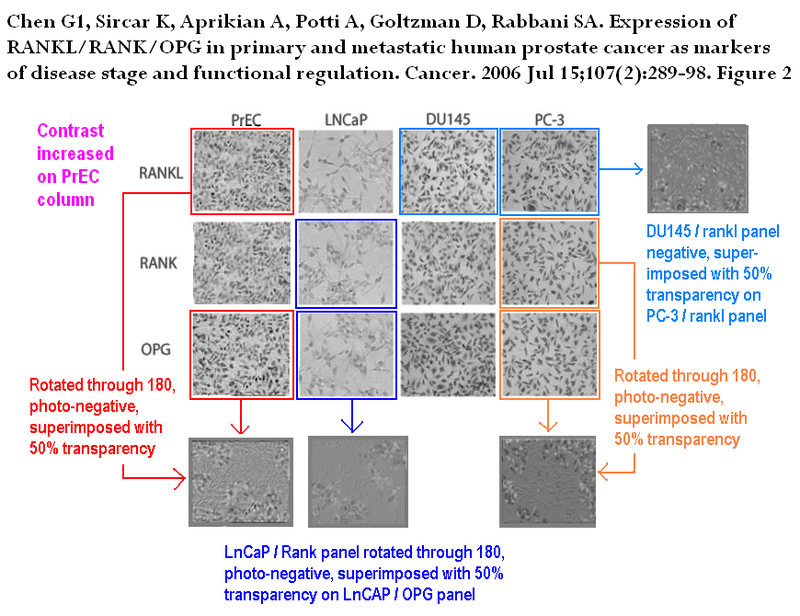 The two lower right-hand panels in that image — ‘RANK’ and ‘OPG’ in the PC-3 column — look very similar, apart from a 180-deg. rotation. A decent start, oh Good Doktor Bimler! Though there is plenty more. For example all three of the fields in the left column have areas of cells that are related. The mystery though is why some sections in these fields are certainly not the same when most of the cells are identical in position and shape. 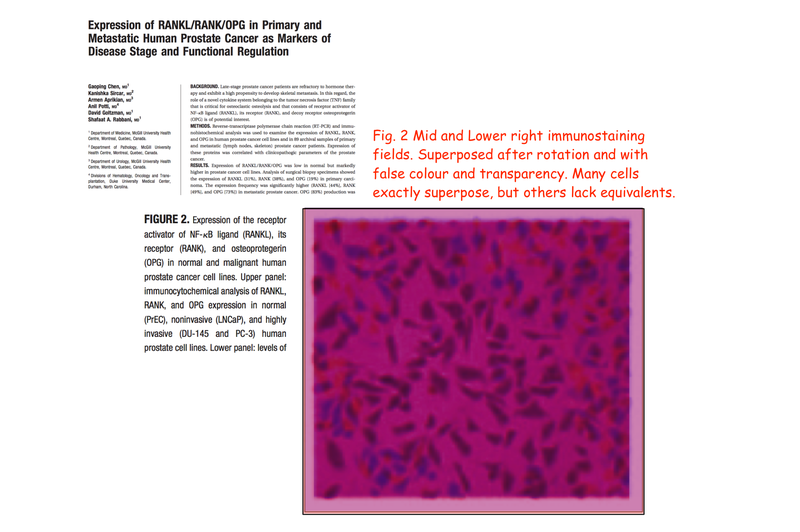 Using red and blue false colours and transparency, see how the left pair that you suggested were related do indeed superpose after rotation, but with many red and blue cells being unmatched. Since these cells have been stained with antibodies, they are fixed and quite dead, so cannot move around. Cells cannot arbitrarily come and go in these stainings. And as far as I know, cells are never sequentially reprobed with another antibody (unlike western blots, though cells can be simultaneously double-labelled in one experiment using labels of different colour). What do you think can be going on here? Can you do the same thing with the panels in the right-hand column? I can 🙂 Here are the right two fields similarly superposed. Observe that most of the centrally placed cells superpose very well. Most of the cells around the edges do not. 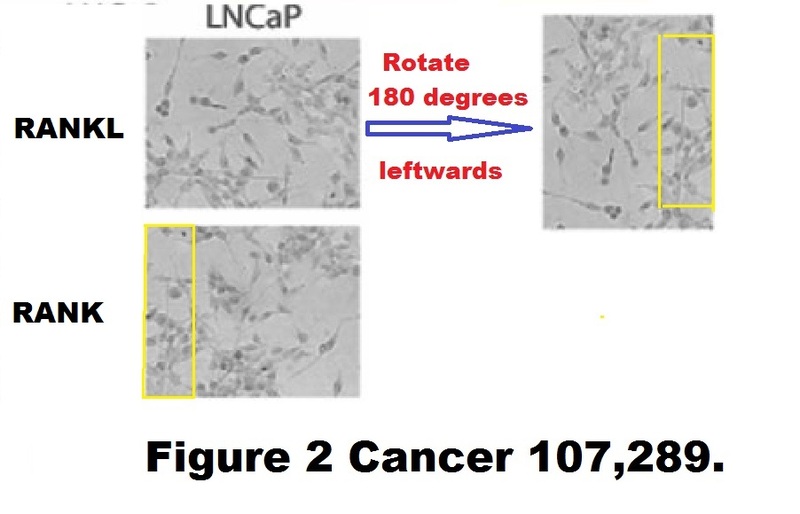 Cells in the top right corner are clearly unrelated for example. Any theories as to how this could have happened? 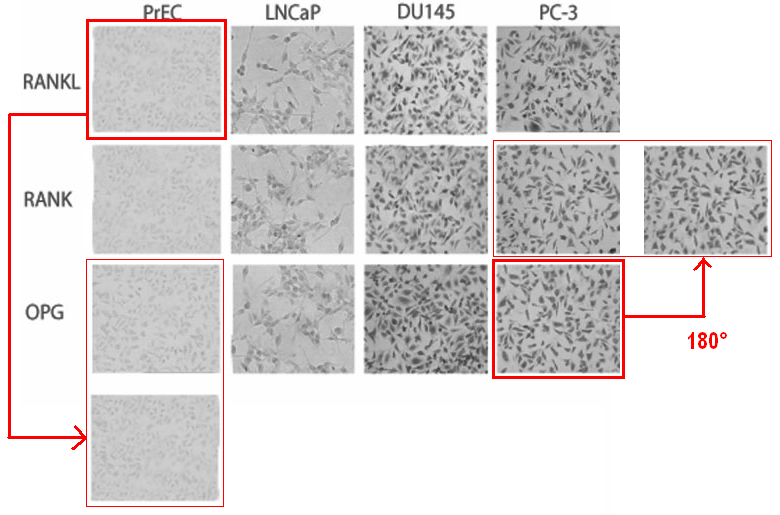 Peer 2 at PubPeer notices similar phenomena potentially linking other panels within the Figure. I am tempted to try the monochrome version of your color-coded super-imposition trick — that is, turning one image into its photographic negative, and superimposing on the second with partial transparency. It will be interesting to see how you fare with the monochrome superposition. Do show us. There may well be better schemes than the quickly bodged false colour that I used. Meanwhile I made a small addition to the last figure. One of them right side fields may also have an in-image duplication. 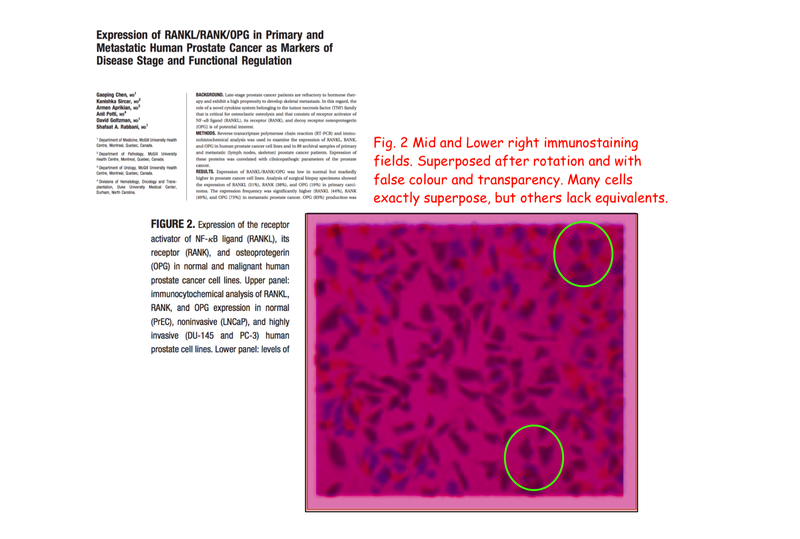 An experiment in image cancellation. Doktor Bimler, your image cancellation seems to work very well! I think if you rotated DU145/RANKL by the usual 180 degrees and superposed it on DU145/RANK, cancellation would be almost complete. This leaves DU145/OPG as the single unique field of twelve, does it not? I think if you rotated DU145/RANKL by the usual 180 degrees and superposed it on DU145/RANK, cancellation would be almost complete. 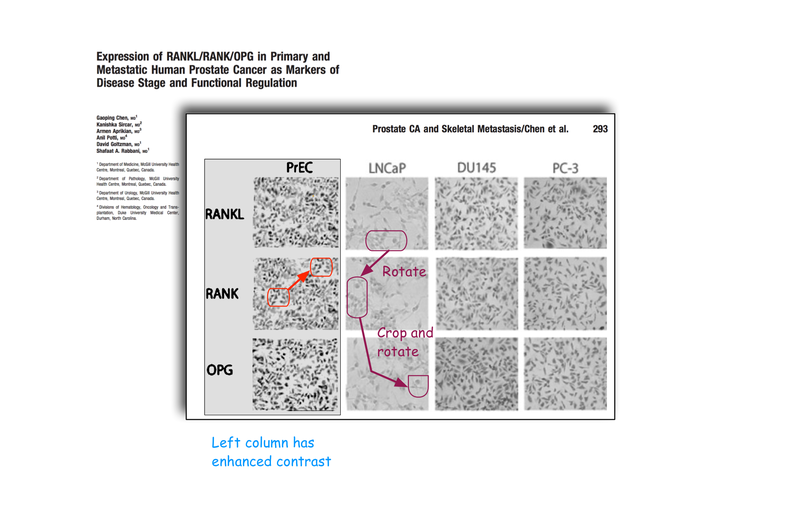 OK, I added DU145/RANKL and RANK; also PrEC RANKL and RANK (unrotated). I have also included the Pc-3 / OPG self-comparison you mentioned. 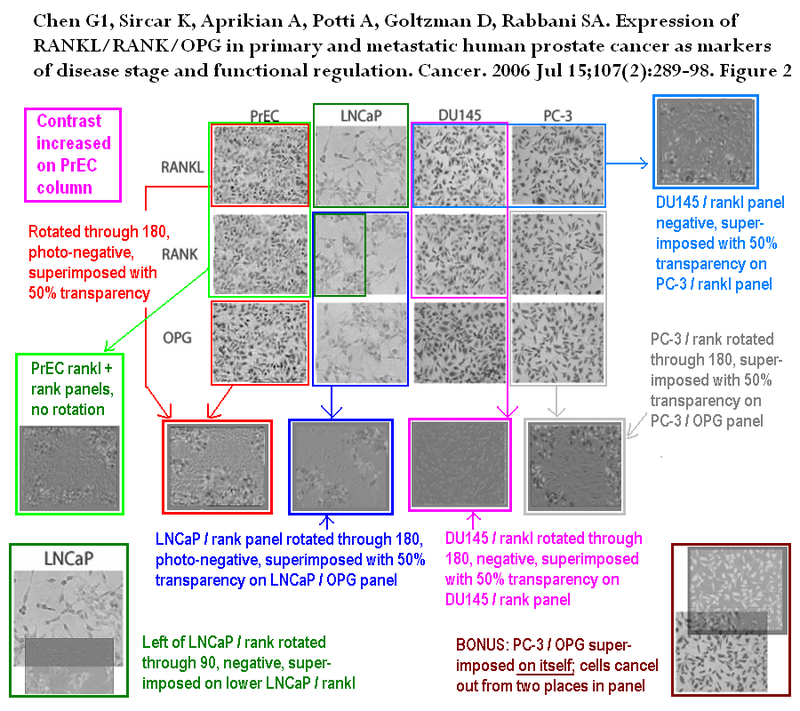 The PCRs in Fig. 1 show, at a quick glance, 16 bands. How many are there really? Only a review of original source materials will reveal how many bands were imaged during the study. It’s not exactly clear from Fig. 1. 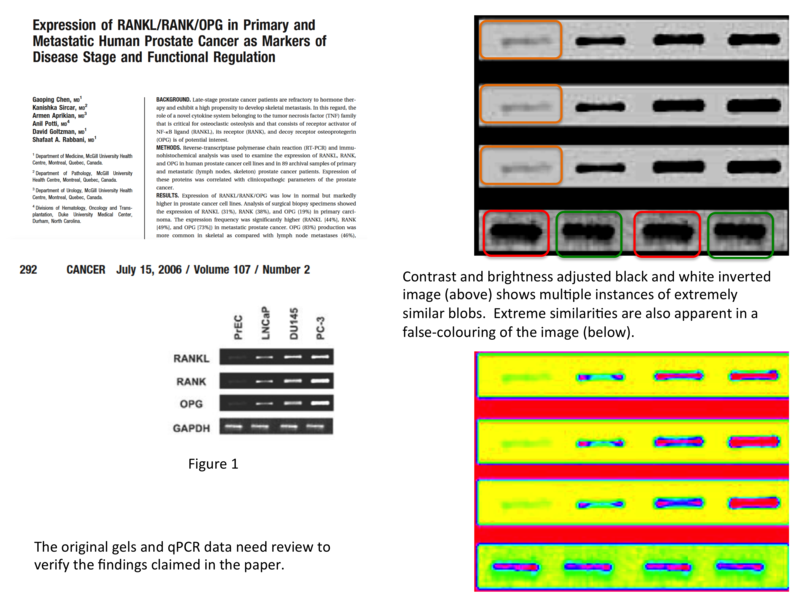 If the upper three gel slices are adjusted exposures of the same original, then the number of unique bands would be six, given the clear duplication of GAPDH controls. As you say, original source materials would indeed be required for unambiguous assignment.